Defiant North Korea has conducted another rocket engine test that can be used for an intercontinental ballistic missile or ICBM capable enough of reaching the U.S. mainland. The technology used for putting satellites into space are the same ones used for an ICBM capable of reaching the west coast of the United States, Fox News quoted American officials as saying. U.S. officials have warned that North Korea is on the path to successfully developing an ICMB capable of hitting the United States unless something changes. The test follows about a dozen missiles launches this year, as well as three engine tests in March. 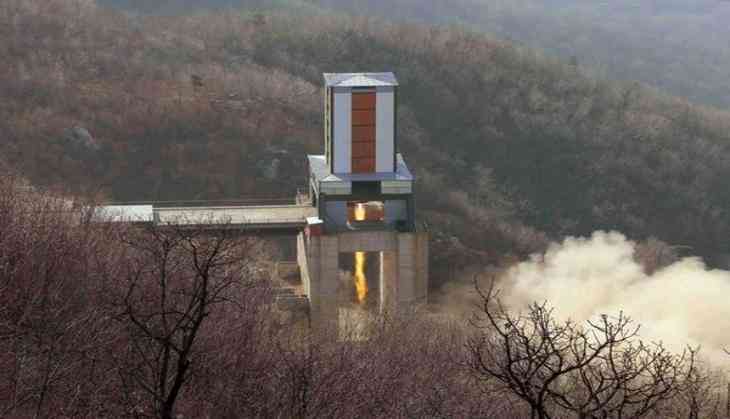 The rocket test was allegedly conducted on Wednesday at the Sohae Satellite Launching Station, where similar tests of the rocket technology took place on three occasions in March. According to unnamed U.S. officials there are signs of increased activity at North Korea's lone nuclear test site. "There are more people and more cars but nobody knows what that means," said the official. North Korea has conducted five nuclear tests since 2006, including two last year. The test follows about a dozen missile launches this year, as well as three engine tests in March. U.S. spy satellites have detected new activity at North Korea's underground nuclear test site that involve some modifications around one of the tunnel entrances to an underground test area, U.S. officials said. They also said that military options for North Korea have recently been updated, and will be presented to President Donald Trump for a decision to act if there is a nuclear test.